Yoga instructor and wellness coach Linda Wells emphasizes self-love in her classes. Gyms are now lifestyle shrines. There are juiceries doing innovative things with kale. There are spas. There are amenity-laden locker rooms with robes as soft as clouds. There are boutiques peddling workout wear designed to streamline, flatten, lift, and transform. If sweat could be turned into liquid diamonds, someone would surely create a smoothie bar to sell it. Sadly, plush towels don’t confer self-esteem. Enter yoga instructor and wellness coach Linda Wells. Wells calls herself a wellness warrior. She left a taxing job as a youth worker to find a new purpose through health. 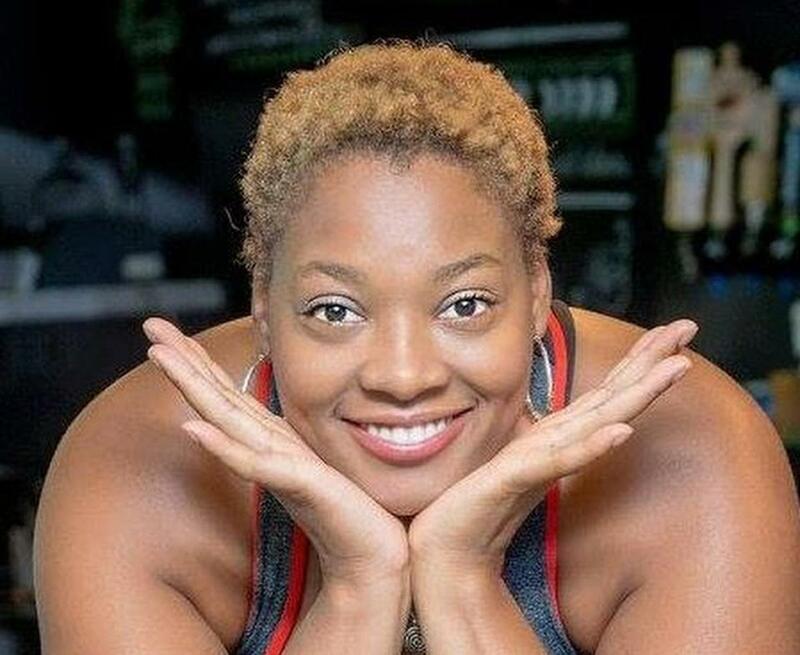 Now, she teaches at 4 Corners Yoga + Wellness in Dorchester and sees private clients for wellness retreats and stress management sessions. She understands how hard it is for scared people to visit the gym. “I was getting bigger and bigger. More miserable. More dissatisfied. I was grieving the loss of so many things. I was becoming resentful. I would go to the gym. I would make a commitment to the gym. He was like that boyfriend: ‘I’m going to see him every day. I’m going to get that weight off me.’ Then, ‘I’ll come by when I feel like coming by.’ I was uncomfortable in my body and being told by people, ‘If you’re uncomfortable, do something about it.’ Do you really think it’s that easy?” she says. It’s not easy — not when you feel like a fitness outsider. Today, Wells often works with people who might feel intimidated at the gym. People for whom a sweaty, strobe-lit cycle session is akin to torture. People for whom the couch is a cocoon. “I work mostly with women. I focus a lot on low-cost classes. I teach a class at Franklin Park in the summer, and any and everybody shows up. People who look like me come. People who felt ashamed going certain places. I think I provide a welcoming vibe,” she says. Wells aims to melt away language of shame that so often exists around fitness — the drive to be the best, to lose weight, to push yourself to the brink and to glow with serenity while doing it. “There needs to be a shift in how we show compassion to one another,” she says. I’ll buy that. Let me confess: I am no marathon runner. A Pilates contortionist, I am not. I was forever the last person chosen for fifth-grade kickball, and I’ve carried that sheepishness with me into adulthood. The gym was simply not a place for Those of My Kind. I’ve started fitness programs and then fallen (awkwardly, uncoordinatedly) off the wagon. I could make excuses, but the bottom line was this: Gyms were for the disciplined and the chosen, for people who never suffered the indignity of an elementary school physical education class while wearing brown plastic glasses. Lately, though, I’ve noticed a shift. My neighborhood fitness studio now offers meditation and herbal workshops. I just got a flier in the mail for a new place in Burlington that has water slides (more on them later). The latest fitness pitch in my inbox involves a yoga session followed by tequila. “There’s been a cultural shift toward more body positivity and acceptance and self-love. You see it in various forms of media, in models who don’t fit the cookie-cutter mold, of people learning to be more self-accepting,” says Amanda Lanham, area leader for Core Power Yoga. Put aside the fact that lifestyle goddess Gywneth Paltrow was snapped working out there last weekend. Lanham says down-to-earth role models have “helped move the needle,” such as body-positive model Ashley Graham and yoga icon Jessamyn Stanley, author of “Every Body Yoga: Let Go of Fear, Get on the Mat, Love Your Body.” Stanley’s classes encourage students to ask “How do I feel?” instead of “How do I look?” At Core Power, Lanham says, some people just sit in child’s pose for the entire class. “There’s been a shift from how fitness makes you look to how it makes you feel,” she says. Rachel Estapa of More to Love Yoga. Somerville’s Rachel Estapa brings that philosophy into her practice, More to Love, designed for larger-bodied women reluctant to try yoga. This month, she launched a five-day routine, More to Love RISE Flow, encouraging her followers with compassionate prompts. Each day has a welcoming theme: Be in Your Body, Mind What Matters. She was inspired to teach after feeling like an outsider at traditional classes. She discusses basics that are sometimes glossed over: For instance, she works with clients on how to perform postures with a big belly. But she thinks the tide is turning, too. “Body positivity as a movement has grown,” she says. Now, just maybe, self-love is more important than perfection. At the North End’s forthcoming boxing studio Knockout North End, Melina DiPaola oversees a gym dedicated to balance. She knows the importance firsthand: As a five-year-old, she developed a pilocytic astrocytoma, a benign brain tumor that affects coordination, balance, and hormonal regulation. She couldn’t participate in sports and underwent several childhood surgeries, eventually visiting a gym to mitigate nerve damage and Bell’s palsy. Today, she has a shunt in her brain to prevent hydrocephalus. Working out is essential, but overdoing it could be dangerous. For Estapa, health exists on a spectrum, individualized for each person. She aims to take those punishing extremes out of well-being: “We assume [fitness] has to be CrossFit or training for a marathon. … It can be as simple or as meaningful as taking five or ten minutes out of your day to breathe,” she says. Credit where credit is due: Planet Fitness opened in 1992 with a “Judgment-Free” motto aimed at targeting casual, first-time gymgoers with $10 memberships. The gym is excellent for people who want to get in and out, but it doesn’t pin itself to that aspirational halo so fundamental to workouts today, which sometimes feels as essential as water. But maybe the culture of luxury will also propel a culture of forgiveness: At Burlington’s new Life Time — which calls itself an athletic resort — there is something called The Zone, a performance, recovery, and chiropractic center where I can only assume people like me can hide from the intimidating world of weights and cry while getting their backs cracked. Really, though, it offers services like gait analysis, foam rolling, hydro-massage, alignment, and nutrition assessments. The center also has an outdoor pool with water slides and a café where people can chill out on laptops. Not too scary. “We’ve created a recovery space,” says brand spokesperson Natalie Bushaw, noting that the company dropped “Fitness” from its name. “People want to know they’re being taken care of,” she says. For Wells, compassion is key. “If you’re in a class and you need that break, take that break!” she tells her clients. The most essential part of exercise, she says, is self-love. “There needs to be that shift in language — it’s going to take people learning how to affirm their beauty and embracing their amazingness and being where they’re at. We spend a lot of time condemning ourselves instead of showing compassion. I’ve had the most success when I embrace my flaws,” she says.